Susan Biniaz, Columbia Law School class of 1983, has been the lead climate change lawyer for the U.S. Department of State since 1989. 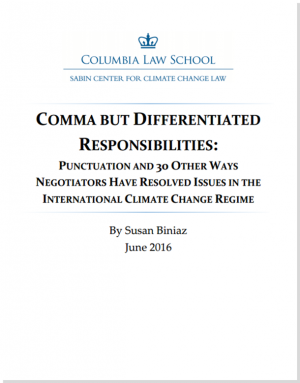 She recently spoke at the law school about her experience negotiating climate agreements. In the fall of 2016 she will be teaching international environmental law as a newly-appointed member of the law school’s adjunct faculty. 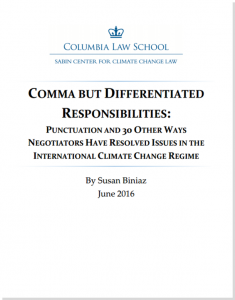 Her new working paper, Comma but Differentiated Responsibilities: Punctuation and 30 Other Ways Negotiators Have Resolved Issues in the International Climate Change Regime, resists simple categorization. It is part play-by-play retelling of decades of climate negotiations, part recipe for successful reconciliation among disagreeing parties, part decoder for anyone seeking to comprehend the layered meanings of key words and phrases in the texts of the United Nations Framework Convention on Climate Change or other key documents, including the Paris Agreement. It is also an entertaining set of examples for legal grammarians who are (rightly) certain that small choices of phrasing, punctuation, or syntax can make big substantive differences. The paper will be published in a forthcoming issue of the Michigan Journal of Environmental and Administrative Law. To download the published version of the paper, now an article in the Michigan Journal of Environmental and Administrative Law, click here. To visit the Michigan Journal of Environmental and Administrative Law’s archive, click here.